Despite operating their motorcycles with great caution, Massachusetts motorcycle operators are frequently injured by inattentive drivers. These injuries can be very serious. Boston motorcycle accident lawyer Christopher Earley has handled, and settled, many motorcycle accident cases successfully over the years. Our office helps motorcyclists that have been negligently injured. A motorcycle accident can wreck havoc. Serious personal injuries, mounting medical bills, lost time from work, damage to your motorcycle, and other losses are typical in these accidents. We are Boston lawyers for motorcycle accident victims that will help you during this frustrating and painful time. When you hire us, we immediately hit the ground running, pursuing for you all available compensation you are owed. Like other motorcycle crash lawyers in Boston, we collect 1/3 of the total settlement as our legal fee. If the case does not settle, you owe us nothing. That is called a contingency fee. We also provide guaranteed FREE, no-obligation case evaluations. We help you pursue all damages caused by the crash. We pursue for you payment for medical bills, lost wages, damages to your motorcycle, pain and suffering, as well as other damages. We are Massachusetts motorcycle accident lawyers that pursue for you all possible sources of compensation available to you. What can I expect in the claim process? We handle everything so all you need to focus on is recovering from your injuries. We work tirelessly to ensure your case is ultimately positioned for the best possible settlement for your motorcycle accident case. If the other vehicle(s) involved in the crash were negligent, then you have a case to pursue for money damages. You can only benefit by having a Boston motorcycle accident lawyer on your side. Most cases settle without the need for a lawsuit to be filed. However, sometimes lawsuits need to be filed. But even if your case is filed in court, most cases settle during litigation without the need for an actual trial. The chances of your case actually going to trial are very slim. Are Massachusetts motorcycle accident settlements taxable? No, neither under Massachusetts or federal law are motorcycle accident settlements taxable. How much will my case settle for? That answer depends on many different factors. Were you responsible for the motorcycle accident? What type of injuries did you sustain? Are any of the injuries permanent? How much are your medical bills? Amount of lost wages? These are some of the questions that need answering in order to give you an accurate settlement estimate for you motorcycle crash case. Roughly 5,000 motorcyclists were killed in motor vehicle crashes in 2015, an 8% increase from 2014. There were 88,000 motorcyclists injured in accidents with motor vehicles in 2015, a 3% decrease from 2014. In 2015, motorcyclists accounted for 14% of all traffic fatalities, 4% of all people injured, 17% of all occupant (drivers and passengers) fatalities, and 4% of all occupants injured. A shocking 4693 motorcyclists died in crashes in 2015. The fatality rate for motorcyclists is roughly 27 times greater than for passenger car occupants. In 2015 41% of motorcyclist deaths involved single vehicle crashes, while 59% involved multiple vehicle accidents. Disturbingly, motorcyclist deaths have been rising in the last 20 years. What Is Massachusetts Motorcycle Accident Insurance? 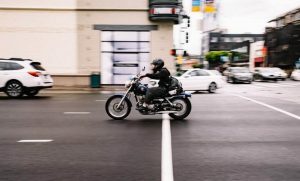 Given how common these accidents are, and how vulnerable they are, it is important for motorcyclists to carry enough motorcycle accident insurance. Carrying quality health insurance is also critical for motorcyclists. Unlike with cars and bicycles, PIP coverage is not available on Massachusetts motorcycle insurance policies. However, if you strike a pedestrian with your motorcycle, PIP coverage is available to that person. I encourage you to buy for as much motorcycle insurance as you can afford. As with most things in life, you get what you pay for. That is glaringly obvious once there is an accident and the insurance needs to be utilized. You should purchase plenty of Medical Payments insurance coverage. Medical Payments will provide additional medical coverage that will pay for the reasonable and necessary medical bills caused by the crash. It is quite inexpensive to purchase high Medical Payments limits, as well as high underinsured motorist limits. You may also make a claim for pain and suffering with the insurance company for the driver that caused the accident. Many car owners have only limited liability policies. The required minimum bodily injury liability insurance in Massachusetts is only $20,000. That is generally woefully insufficient to adequately compensate an injured motorcyclist. It therefore makes sense to make sure you purchase plenty of underinsured motorist coverage. This insurance is quite cheap and provides financial protection to you. This is insurance you can turn to if the driver who caused the crash has insufficient bodily injury liability insurance to cover your injuries. How Can A Boston Motorcycle Accident Lawyer Help Me? A Motorcycle crash lawyer begins by investigating the accident. Video and photos of the accident scene are secured. Photos of your injuries are also obtained. Witnesses (assuming there are any) are contacted, and the police report is obtained. The lawyer then looks into all available insurance money available to compensate you. Proof of lost wages (if applicable), and copies of your medical records and medical bills are obtained. Eventually, a settlement demand package will be sent to the insurance company in hopes of settling your accident case. Shortly thereafter settlement negotiations will take place with the goal of resolving the case. A settlement will be reached, and if it is not, a lawsuit will be filed. It is important to have a qualified and experienced Boston motorcycle accident lawyer for your motorcycle accident case. The insurance company for the driver that caused the accident is solely focused on limiting your rights. Most notably, the insurance adjuster wants to pay you as little as possible. Don’t let that happen to you. Fight back and hire us as your Boston motorcycle accident law firm. Let us handle the claim so you don’t have to worry about the insurance company trying to limit what you are entitled to. We have handled many different types of motorcycle crash cases in Massachusetts. We know how to achieve a fair settlement for your case. Read what our clients say about us, and see the results we have obtained for our clients. Contact Boston motorcycle accident lawyer Christopher Earley today for your free, no-obligation consultation if you need help with a Massachusetts motorcycle accident case. We will aggressively pursue all available damages you are entitled to. We recently settled a motorcycle crash case for a client who was a passenger on a motorcycle that lost control. As a result, our client suffered lasting scarring and deformities. The case settled at mediation for $ 150,000. We represent injured motorcyclists in Boston, MA and serves clients throughout Massachusetts including Cambridge, Somerville, Chelsea, Everett, Malden, Revere, Lynn, Lawrence, Andover, Newton, Quincy, Medford, Plymouth, Worcester, Fall River, Bellingham, Weymouth, Natick, Stoneham, Wakefield, Reading, Wilmington, Burlington, Lynnfield, Saugus, Peabody, Danvers, Middleton, North Andover, North Reading, Woburn, Canton, Stoughton, Randolph, Dedham, Norwood, Mansfield, Taunton, Brockton Suffolk County, Middlesex County, Essex County, Worcester County, Norfolk County, Plymouth County, Bristol County and Barnstable County.